One of these gourmet trucks is Soho Road, a mobile concept that delivers authentic Indian street food — and even has a tandoor oven on board. Its name, says Soho Road’s owner Sarb Mund, was inspired by a road in England. “We couldn’t find a great curry here anywhere, so we thought that the coolest thing to do was [to] be able to showcase a tandoor oven, have it on the street, and have everyone be able to enjoy it like we do,” says Mund. Soho Road specializes in naan kebabs. Mund says one of Soho Road’s menu standouts is the butter chicken, a naan kebab that’s not been done anywhere else, as far as he is aware. Tacofino is an operation with two food trucks and three brick-and-mortar locations. As its name suggests, Tacofino is a Mexican-inspired concept. The fish taco is what they’re most famous for, but menu items like the tuna taco take a playful spin: seared albacore tuna with cabbage, salsa fresca, ginger, wakame, and wasabi mayo. Tacofino, like many Vancouver food trucks, take a local sourcing approach. All of their produce and proteins are sourced locally, and all of the fish used is sustainable. “When somebody orders dishes from our food trucks, they’re really able to experience the produce and the seafoods and the meats that we’re able to produce around this area,” says Ng. And what’s a food truck scene without some grilled cheese? 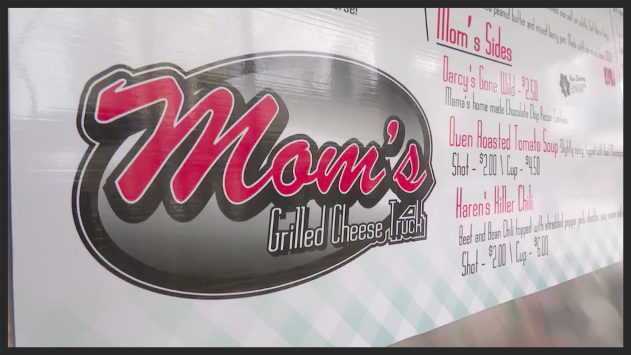 At the aptly named Mom’s Grilled Cheese Truck, owner Cindy Hamilton and crew have built a gourmet menu on a classic comfort staple. Mom’s includes a build-your-own format grilled cheese but also features options like The Sweet Little Val — lemon mascarpone, poached blueberries with thyme and honey, and slivered toasted almonds grilled between buttered brioche. Hamilton’s mergence into the food truck biz is a bit different than most food truck owners. “I was rock climbing one day, and I overheard two guys talking about how there was a Hollywood film coming to Beijing, and no one [there] did any Western-style catering,” says Hamilton. She had always loved to cook but had never done it for a living, so she told them she’d cater the film for them. That film just so happened to be “Kill Bill,” and two days later, Hamilton was on the set, in Beijing, catering. She stuck with TV catering for five years until having a child. Starting the food truck and quitting film was the only way she could afford a flexible schedule to spend time with her daughter. But it seemed a natural fit. “Anywhere I travel, the first place I hit to eat is on the street,” she says. Locals and visitors alike are taking to the streets of Vancouver for a bite. Check out the “On Foodable Side Dish” episode above to get a closer look into Vancouver’s local (and delicious) food truck scene.